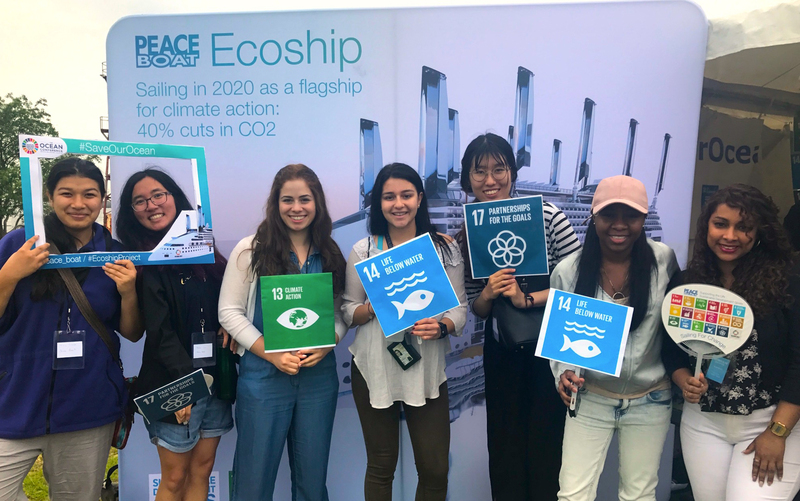 Peace Boat’s Ecoship was a proud participant and supporter of the Ocean Conference which convened at United Nations Headquarters in New York from 5 to 9 June 2017. The delegation attended the full conference, participating in plenary, partnership dialogues and numerous side events. The conference was opened by UN Secretary-General António Guterres. Isabella Lövin, Minister for International Development Cooperation and Climate and Deputy Prime Minister of Sweden who had been onboard Peace Boat on the previous Friday, and Josaia Voreqe Bainimarama, Prime Minister of Fiji, were inaugurated as Conference Co-Presidents. The conference was largely considered a success in building momentum for the implementation of SDG 14, as a central rather than isolated component of the 2030 Agenda. It produced three outcomes: an intergovernmentally agreed Call for Action; a registry of voluntary commitments; and key messages from the partnership dialogues. 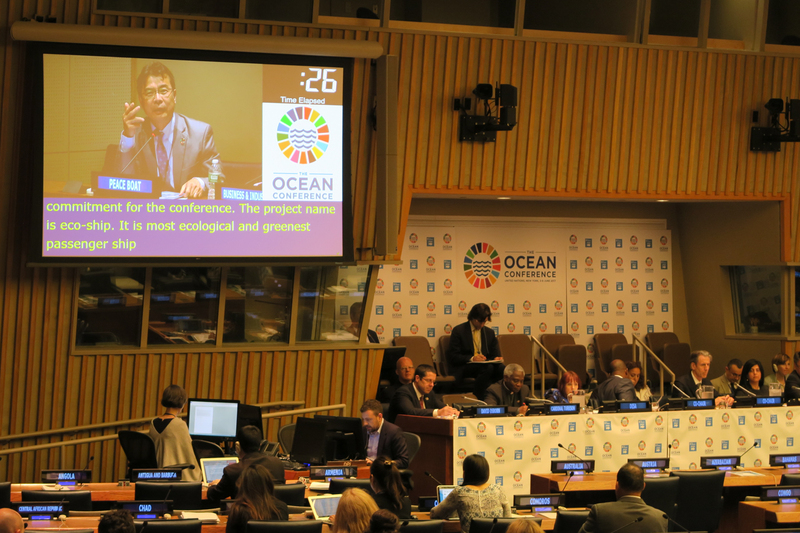 Seven partnership dialogues were an official part of The Ocean Conference. Interactive and multi-stakeholder in nature, they focused on recommendations to support the implementation of Sustainable Development Goal (SDG) 14. Peace Boat Founder and Director, Yoshioka Tatsuya presented Peace Boat’s Ecoship in the partnership dialogue focused on “Minimising and addressing ocean acidification” co-chaired by Monaco and Mozambique. Ocean acidification is a threat to marine organisms, ecosystems, services, and resources and its mitigation and long-term control depend on the reduction of emissions of carbon dioxide into the atmosphere. Yoshioka spoke about the technology used onboard the Ecoship including solar panels, ten retractable sails and increased energy efficiency. “With such technology existing nowadays we can build such a ship, and reduce CO2 emissions by 40%,were” he said. The Ecoship will be fitted with laboratories for marine research on ocean acidification including in coastal areas where data is lacking. Peace Boat will partner with academic, governmental institutions for further research into ocean acidification as a contribution to target 14a. The Ecoship was the first voluntary commitment to SDG from civil society. During the Ocean Conference, the Peace Boat delegation was honoured to meet with H.E. Mr Peter Thomson, President of the 71st United Nations General Assembly. Mr Thomson congratulated and expressed his appreciation for Peace Boat for being the first civil society organisation to submit a Voluntary Commitment at the preparatory meeting for the conference in February and listened as Peace Boat’s Founder and Director explained more about the project and Peace Boat’s commitment to mitigating climate change and ocean degradation. They discussed Peace Boat’s history of learning from people to people contact and experiences of visiting Small Island Developing States (SIDS) by ship and hearing from local people about their first-hand experiences. 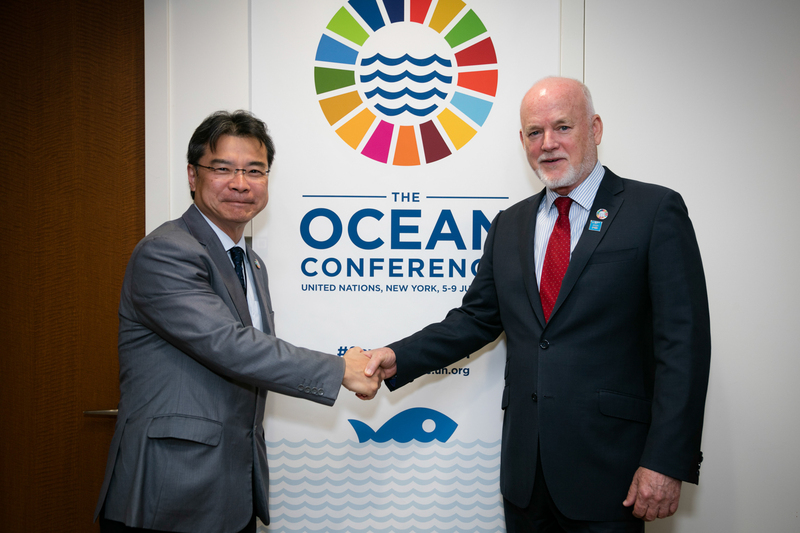 Yoshioka shared with Mr Thomson, Peace Boat’s Voluntary Commitment to SDG 14 of the Ocean and Climate Youth Ambassador Programme which will bring youth from SIDS to Europe and New York onboard Peace Boat to give testimony of the effects of ocean degradation and climate change. The Ocean and Climate Youth Ambassador Programme was formally and publicly announced at Peace Boat’s Side Event at the Ocean Conference. The Side Event, which was co-sponsored by the NGO Committee on Sustainable Development-NY was entitled From Awareness Raising to Action: the Role of Civil Society and Youth. It focused on key issues of the Ocean Conference including the impact on SIDS and the key role of youth in achieving the SDGs including SDG 14. Keynote speaker at the Side Event was Permanent Representative of the Maldives to the United Nations and Chairman of the Alliance of Small Island States (AOSIS), Ambassador Ahmed Sareer. Peace Boat was honoured to have on the panel Senator Sherwood Tibon of Majuro Atoll, Republic of the Marshall Islands and Jon Bruno of The International Ecotourism Society. Key youth representation came from Mr Desmond Doulatram, Republic of the Marshall Islands, Ms.Briana Whylie, DPI Youth Delegate and Ms Milka Rodriguez, Youth Scholar and Environmentalist. Mr Doulatram spoke about his experiences in the Marshall Islands where he founded a number of NGOs working on key issues of climate change and ocean degradation including the devastating impact of nuclear testing on the Pacific Ocean and Marshallese people. Both Mr Doulatram and Senator Tibon’s interventions raised a key issue in ocean welfare that had so far been missing from the discussion at the conference, that of the devastating impact of nuclear radiation on the ocean. The side event was attended by delegates from a wide range of backgrounds including many youth delegates who posed questions to the panel specifically on youth engagement. Public outreach and awareness raising were an important part of The Ocean Conference as organisers aimed to increase widespread awareness of the important role of the ocean publicly as well as amongst delegates. The conference made use of both traditional and social media with the hashtag #SaveOurOcean. 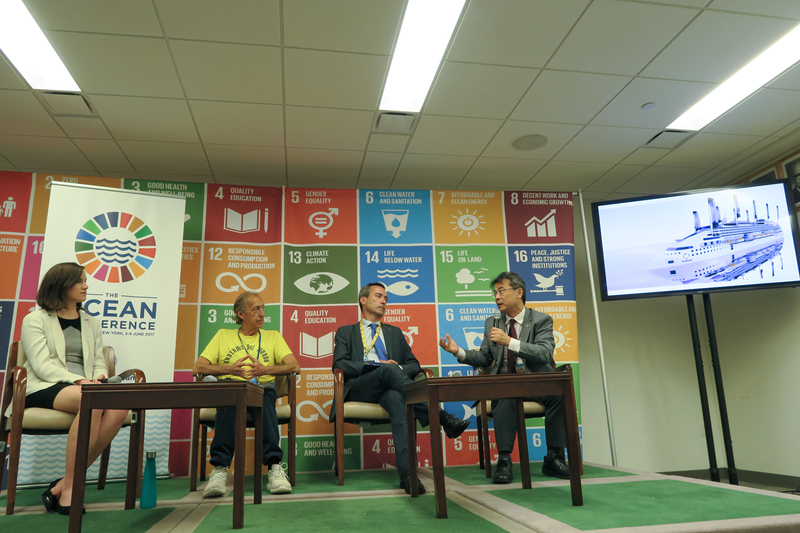 Yoshioka was on the first panel of the SDG media zone broadcast from the United Nations headquarters. The panel which focused on marine pollution showcased initiatives aimed at reducing marine pollution, target 14.1 of SDG 14. Yoshioka who was joined by Kenny Young of Artists Projects Earth and Stefano Ciafani of Legambiente. Yoshioka stressed the important role that the shipping industry must play in addressing SDG 14, with particular reference to target 14.1. He introduced Ecoship which is fitted with closed water and closed waste loop systems onboard for zero discharge and close to zero waste to mitigate marine pollution. Yoshioka closed stressing the importance of education for achieving not only SDG 14 but all the Sustainable Development Goals. Peace Boat will continue to sail to raise awareness of the importance of ocean health, climate action and the 2030 Agenda for Sustainable Development.